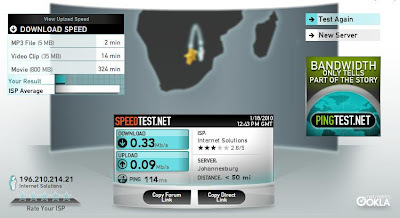 IS have plenty of Seacom bandwidth. Did you ever stop to think that just maybe they sell this to clients who actually pay them decent money for it, and not to DSL bottom-feeders? @Anonymous: Please define "DSL bottom-feeders?" 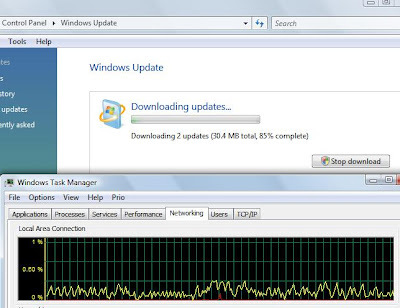 since I pay IS for the bandwidth that I use, as well as the speed. 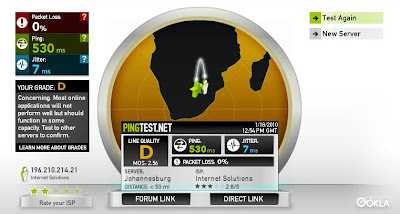 I pay Telkom for the 384kbps connection to the exchange, and when I connect with an M-Web/SAIX account I get 384kbps download speeds. With ISDSL I only get the 384kbps speed on a Sunday. As for bandwidth, I am paying ISDSL for 20GB per month (not local, but international). Does that make me a "DSL bottom-feeder"? Please advise. "clients who actually pay them decent money" ??? If you PAY what they ASK, it must be decent money. If they want more, why don't they ask? It's more HONEST than taking your money and not giving service. "I'm sorry, sir, but we can't fix your problem because you are just a lowly DSL bottom feeder and we have customers who are far more important who pay us a lot more money." This would be a more honest approach, but hardly good for business. It is a pity, as my IS connection is just as lightning fast as yours, according to your meaningless ping data.